Every other day, we chance upon some BTS pictures from the sets of Ranveer Singh and Sara Ali Khan's Simmba, which make the wait for the film so very difficult for us. On Friday, Sara treated her Instafam to a fabulous photo of herself, in which it appears she is prepping for an action sequence. "Rohit Shetty ki heroine," she captioned the post, in which she is sporting an all-black look. Rohit Shetty is the director of Simmba and trust him to include some great action sequences in every film he makes. Sara's picture has been liked by actresses like Tara Sutaria and Ananya Panday, who are making their Bollywood debut with Student Of The Year 2. Take a look at Sara's picture here. Simmba stars Ranveer as a cop while Sara plays his love interest. It is a remake of Telugu film Temper and the first schedule was shot in Hyderabad's Ramoji Film City. 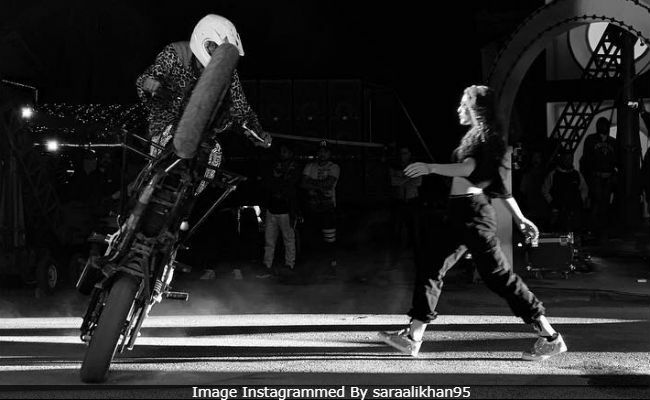 Earlier this week, we got a glimpse of Sara and Ranveer rehearsing for a song and their pictures were all over the Internet. In case you didn't know, Golmaal actors - Arshad Warsi, Shreyas Talpade, Kunal Kemmu and Tusshar Kapoor - also have shot for a special song sequence for Simmba. All the Golmaal films have been directed by Rohit Shetty. Last month, Ranveer, Sara and Rohit Shetty went to Switzerland to shoot for the film. Simmba is Sara's second film. She debuts in Bollywood with Kedarnath, up for release on December 7 while Simmba is expected to hit the screens on December 28.